We love breakfast at G3. So, is it an old wives’ tale, or is breakfast really the most important meal of the day? Perhaps your mother always made you eat hot lumpy porridge in the morning, so as soon as you escaped her clutches, you developed the coffee and cigarette habit in college, and ever since then breakfast really began at lunchtime! Hah! But did u know that breakfast can actually rev up the metabolism and help you lose weight? 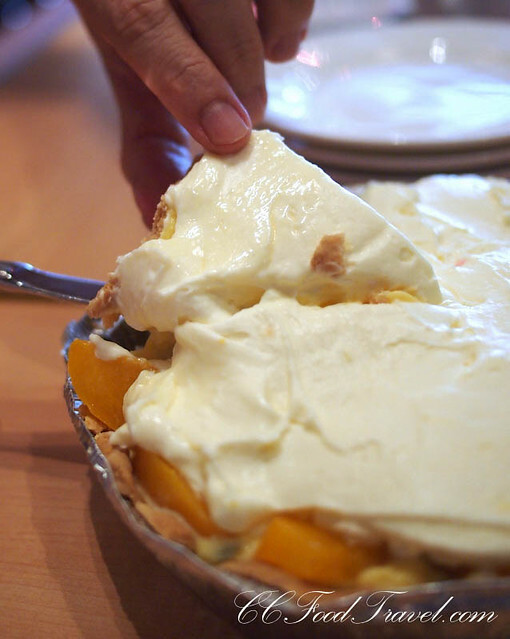 If you’re one of those people who thinks skipping breakfast is a good way to lose weight… think again. We on the other hand, do not need persuading. We are totally 100% for breakfast. 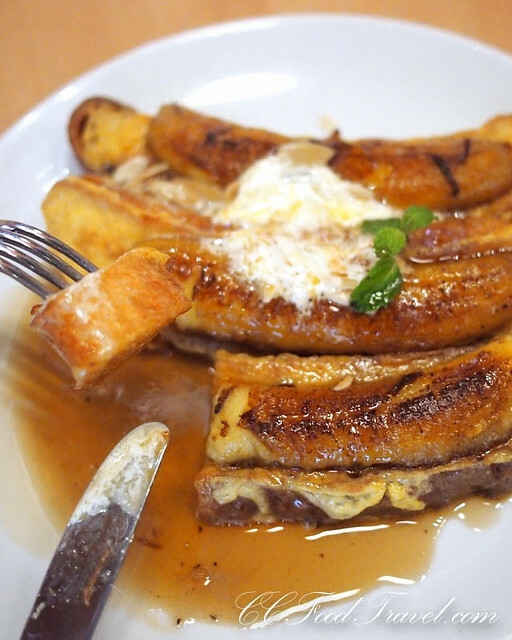 And nothing says breakfast like warm, chewy French toast dripping with maple syrup and served with huge slices of ripe caramelized banana. 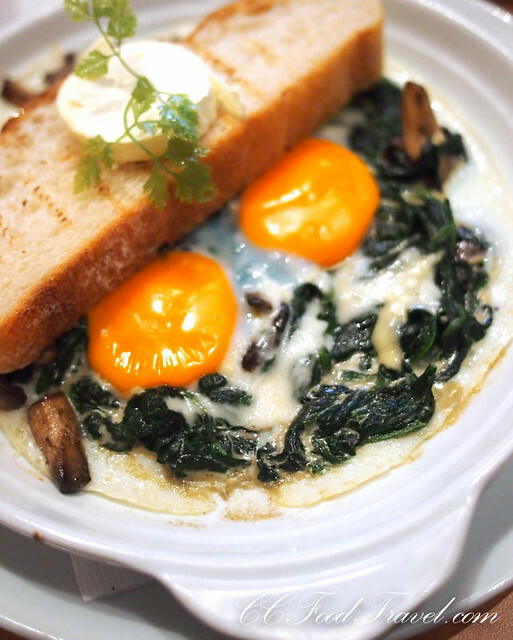 And if you don’t like sweet breakfasts.. then there’s always the sunny side ups with spinach, ricotta cheese and mushrooms to rock your boat. Here we have the elements of a vegetarian lasagna filling—ricotta, spinach, minus the carbo lasagna sheets, and added to it, mushrooms and 2 sunny side ups. But if you don’t like spinach, there is yet again always STEAK for breakfast! That’s right.. morning is as good a time as any to wake up the carnivorous appetite. And eggs. We can never get enough of it.. Serve eggs for breakfast, as Benedict, sandwiches or on top of steaks, waffles, burgers or hash.. no matter what.. all manner of eggs are always welcome! Finally, finish it off with birthday cake.. and that my friends is an atypical breakfast maybe.. but typical of us! Thanks for feeding cake to the hungry monkeys (Jon, CK, Kenny, moi) FBB, and Happy Birthday A lil Fat Monkey! 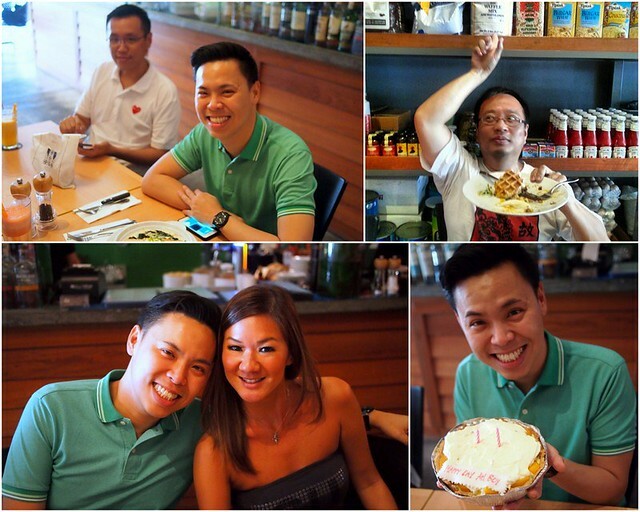 Come back more often so we have more cake to eat..
Top Right Corner – FBB shows us were his waffle came from. Always full of useful info, he is. Previous articleHaving a beast of a time.. at BEAST ! Breakfast is my favorite meal and the french toast, eggs Benedict, and steak look fantastic. gorgeous pics as usual….. hmm, I wasn’t amused that the place doesnt serve plain water, but only bottled water. this after spending a fortune on juices and coffee. Mmmm….. Eggs for breakfast anytime! 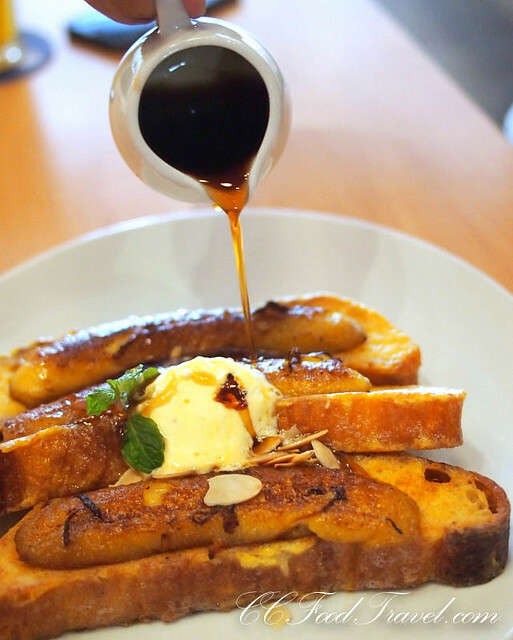 Sweet breakfast is weird for me, well except kaya toasts la. Everything looks delicious! I would take the steak nothing like meat in the morning. another big meat eater i see! for a while I thought that banana was sausage! Sausages are good too! with Maple syrup.. YUM!! looking delish! i wanna grab the gals to come here oredi! How’s the prince range? I love breakfast too and these are my type of breakfast!